For the last few weeks I have been teaching on the different ways the apostles communicated the gospel in the book of Acts and along the way I have recommended a few books. I wanted to put them up and post some links so that anyone interested in following up can do so. Here is the short list. 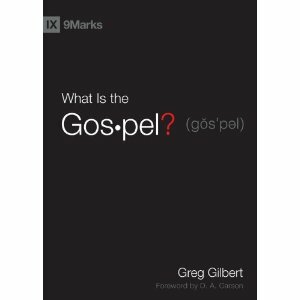 Greg Gilbert is an assistant pastor at Capitol Hill Baptist in Washington DC and this book answers the most pressing question of our day, or any day for that matter. Gilbert does a great job of communicating the Gospel of Christ in a systematic way and his writing style makes this an enjoyable read for anyone. I would recommend this book not only as a source for our own edification, but as a wonderful giveaway option for friends, co-workers and neighbors. Follow this link and you can pick up What is the Gospel for less than $10. This next book has been a really challenging and encouraging read for me and hopefully it will have the same impact upon you. J. Mack Stiles has written a wonderful book titled Marks of the Messenger. This is very much a book on the topic of evangelism, but it goes beyond simply understanding the gospel message and it gets at the heart of the gospel messenger. I can’t say enough about this book and I strongly recommend it to you. Follow this link to pick it up Marks of the Messenger $10. Finally, this last book was the one I referenced as a resource to aid in the development of a Biblical Theology that will help us to be equipped to communicate the over-arching narrative of Scripture. My wife and I have decided to use this book to guide our family devotions with our three kids (6, 4, and 2). I’ll let you know how that goes. But for you and I this work does a really great job of putting the whole of the Biblical narrative into a single story. Follow this link to grab The Drama of Scripture for less than $15. This entry was posted in Evangelism, Family, Uncategorized. Bookmark the permalink.